Read Tafseer ul Quran by Ibne Kathir in your iPhone and iPad in English Language. Its the First Featured Tafseer ul Quran with cool effects with text customization options for best reading results. You can read Complete tafseer of all the chapters of Quran in this Version. 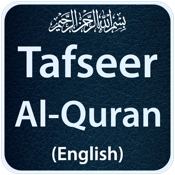 • Complete Book of Tafseer ul Quran in English Language. • Tafseer ul Quran by Ibne Kathir with stylish look. • Cool effects, Can study for long, harmless for eyes. • Featured with text and background customization options. • Unlimited Bookmark feature added. • Text size can zoom +/- with finger gesture. • Both iPhone and iPad layouts are built. • Flip on screen to display the next page. • Can send or share any part of text on social website ie Facebook Twitter or can e-mail to your friends. * Its the Full version with Maximum Data & Ads Free Version.